Let me start with saying I love the feeling of having freshly painted nails. It just makes my hands look so pretty and feels like a little bit of luxury. It's such a treat for me to set aside some time and pamper myself. The dream is to be able to go to a salon and get them done professionally, however I just don't have the time or the money! I think I have found a great alternative. 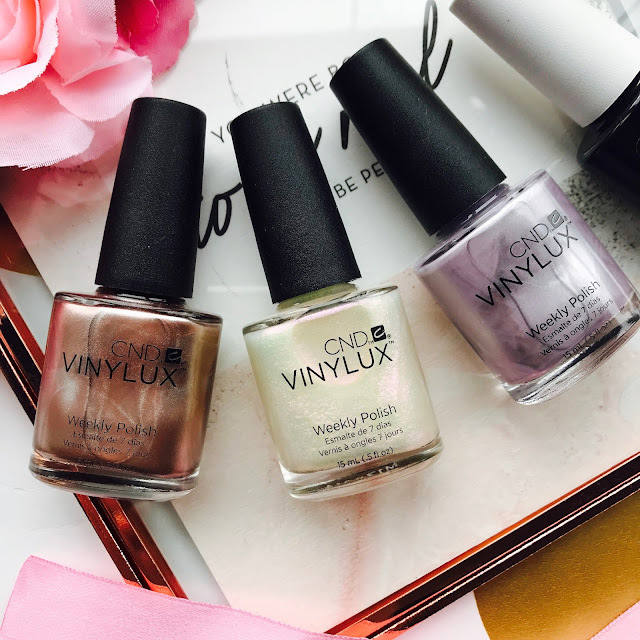 Cue CND Vinylux Weekly Polish. * If you haven't heard of CND before, it may be because they are widely used in professional salons. However with the release of their weekly polish it is now easier for us to get this salon quality at home. The idea is you apply two coats of nail polish and one coat of the top coat and you are left with nails that will last up to 7 days. Left to Right: Radiant Chill, Ice Bar, Alpine Plum. 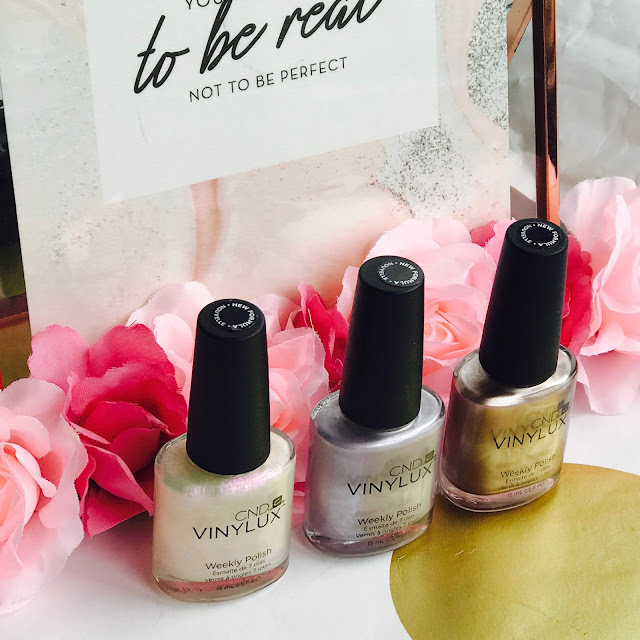 The four polishes I was sent are:- Radiant Chill (£6.95, 15ml), a beautiful rose gold colour, Ice bar (£6.95, 15ml), a shimmering iridescent colour, which works great as a topper, Alpine Plum (£6.95, 15ml), a metallic lilac and finally the weekly top coat. I have enjoyed wearing the colours, together, on top of each other and creating feature nails using them. Tried and tested, I can say they do actually last the seven days, as long as you use the top coat. The top coat is where the long lasting technology comes in. With exposure to natural light over time the nail polish becomes more durable and long lasting. This also explains the black bottle it comes in (as to not allow any light into the bottle). The only wear I saw after seven days was slight chipping near the bottom of the nail, where natural wear and tear would occur. In the above pictures I applied Ice bar over the Ring finger nail to create a shimmer over the top of the other colours. I really liked this effect and think it added a little dimension to the nails. One thing I will say is the nail polish has a very strong smell. As do most nail polishes, however I put this down to the fact these are salon quality nail polishes. The rounded shape of the brush and formula of the nail polish make it very easy to apply. The bottles suggest two coats of nail polish however I only applied one as the colour pay off was great. I would recommend buffing the nails prior to application to totally smooth your nails out, as the metallic effect can cause the ridges in your nails to show a little more. 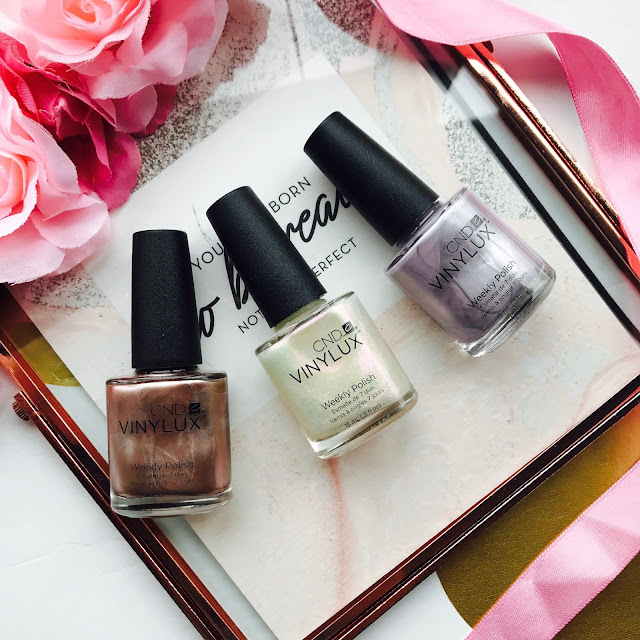 Overall I am really impressed with the nail polishes and think they would make a great stocking filler or gift. The colours are perfect, so feminine and perfect for the upcoming Winter months. 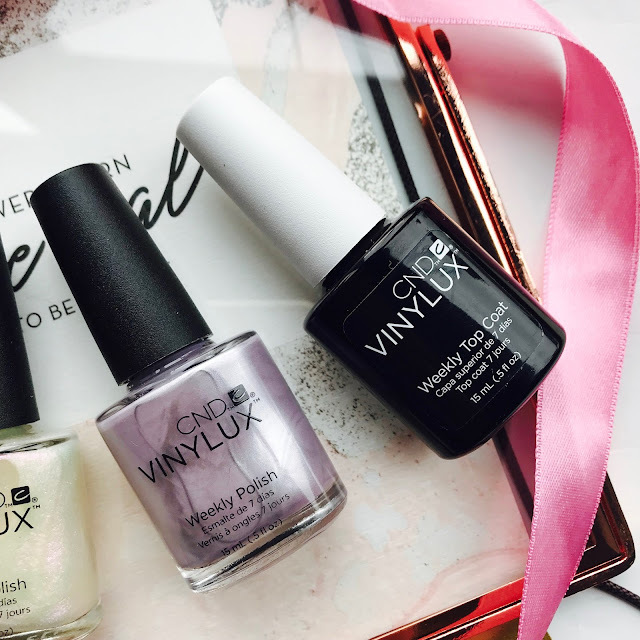 Have you used CND before? Which colour is your favourite? Your nails are always so amazing! I wish I could wear it more often but I just don't have time! Love those metallic shades, perfect for Christmas! Can't wait to wear them around Christmas!! 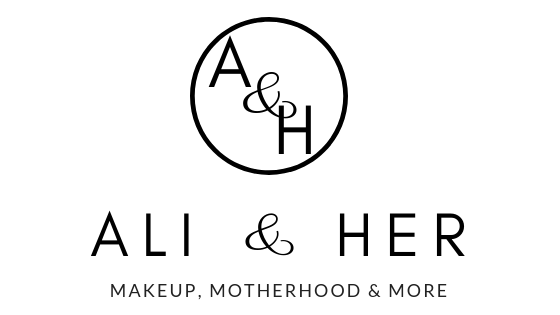 This was the first time I tried them and was so impressed!